The QS Tracker web site allows members of J&J's Quantitative Sciences departments to collaborate on status and goals for a large number of drug modelling projects. 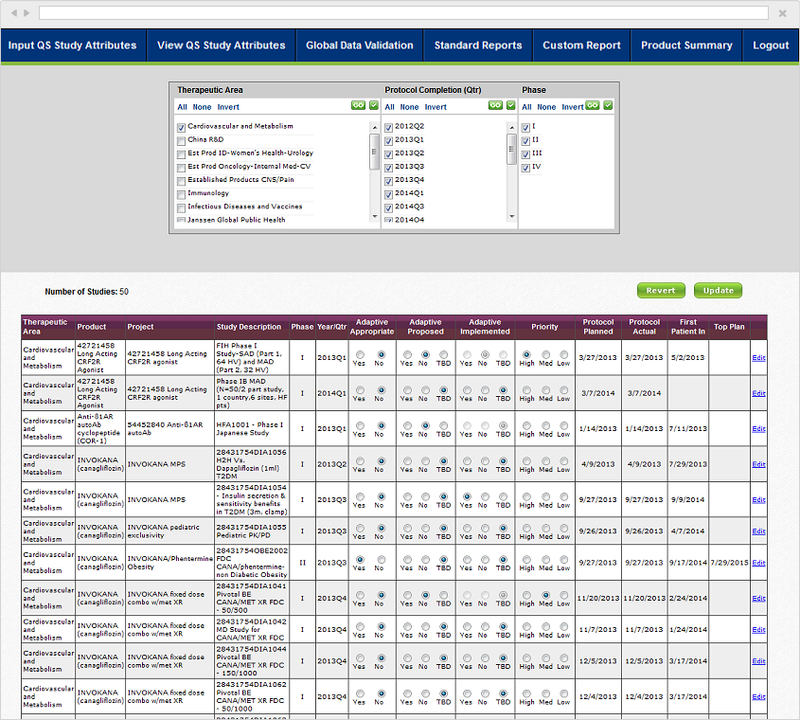 Users can specify models, methods and tools employed in their analyses. The QS Tracker allows J&J scientists and mathematicians to manage every aspect of a modelling study. Studies are imported from the central database and then characteristics are assigned to each study. Starting with Adaptive Designs, modellers input whether Adaptive Design is appropriate and if so, when various protocols are put in place. Design Methods are specified along with the various modelling tools required. Each modeler can share their objectives and results with other users. 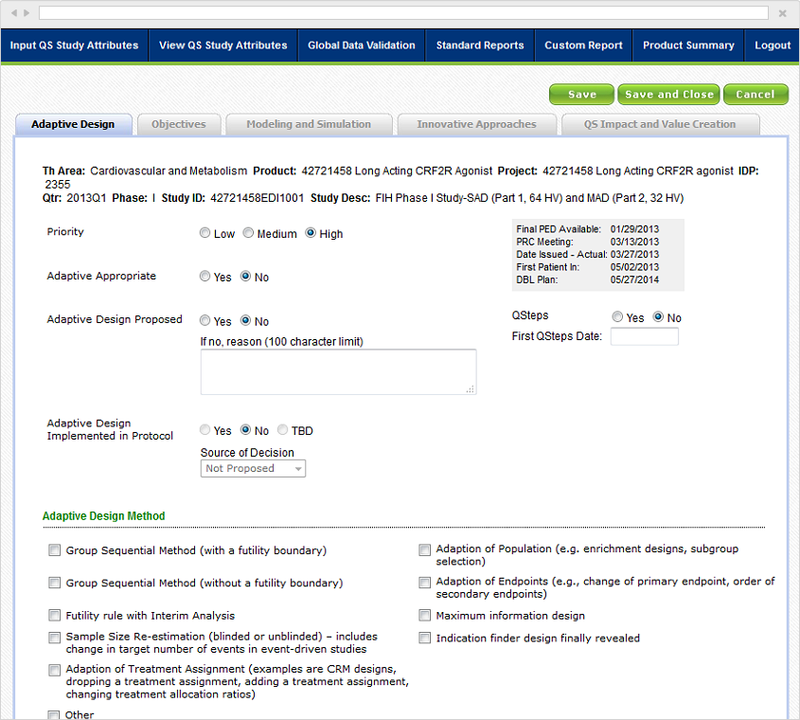 They can also specify what types of models and simulations are employed. If there are any innovative approaches, these can be established. Value Assessment can be determined as well. Once the data has been input, the QS Tracker offers a variety of methods for viewing the results visually, in a report or output to a CSV file for importing into other programs. The program also offers Global Validation for quality assurance, a battery of standardized reports for tallying up objectives and there is even a user-customizable report to hone in on specific characteristics. 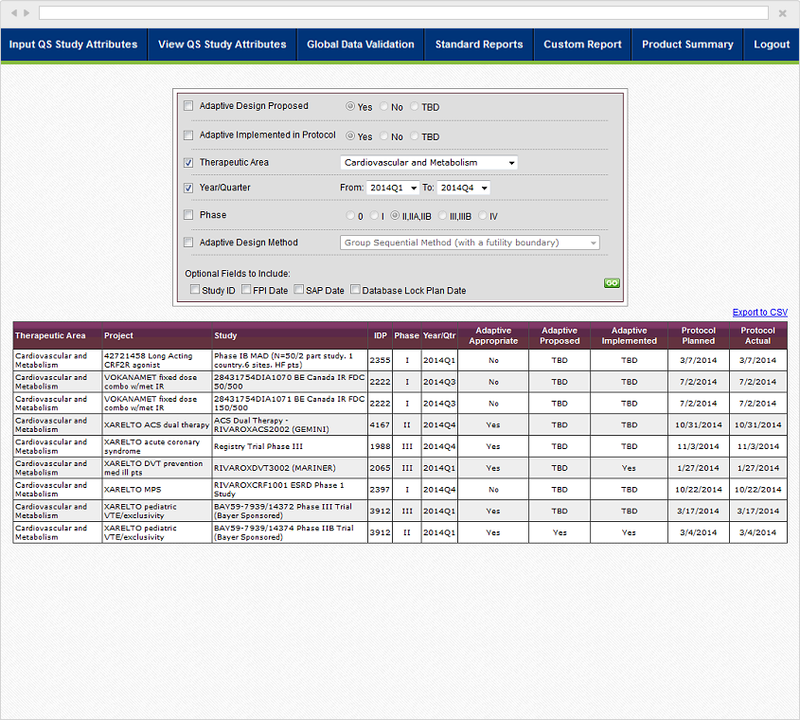 As above, these reports can be displayed visually, printed or exported into a CSV file. A unique picker methodology allows J&J scientists to rapidly narrow down a potentially bewildering set of studies into a specific subset of interest. This picker methodology is uniform throughout the system to minimize the time required for training new users. The program is well into its third year of use and shows great promise in fostering intra- and inter-department communication and analysis.